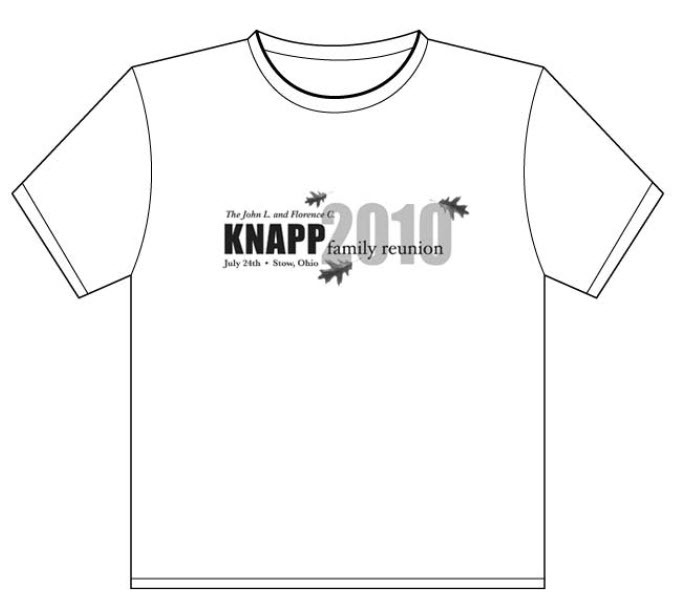 Just 14 DAYS left before the 2010 Knapp Family Reunion! Folks, just a quick note to remind everyone to get your t-shirt orders into Lori Knapp Albright ASAP! She needs to get orders into the t-shirt shop in time for the reunion. She is still waiting to hear from two branches of the family (Bernie’s and Tom’s branches). Remember: the money we make from t-shirt sales helps defray the costs of renting the shelter at the park, providing the food and disposable dinnerware and cutlery. We would prefer to continue to make this a FREE event – and t-shirt sales will help us to continue to do that. 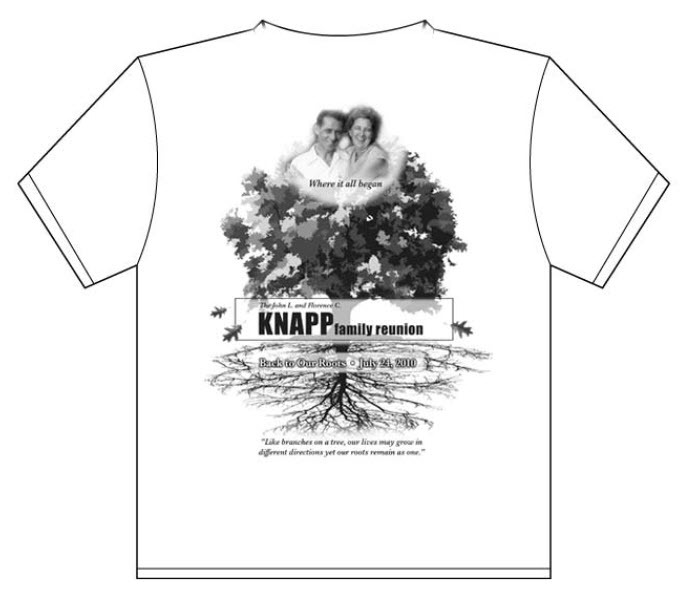 Each branch of the family (Ray, Gary, Bernie, Tom, Don and John) will have their own t-shirt color. And won’t it be nice to take home a little piece of family history with you? Plus, we will take a GROUP PHOTO at the reunion for your family album. It would be great if we could have every branch of the family represented in their family’s t-shirt color. It will make a great picture! To those that have already ordered shirts, thank you for your support! Childrens’ sizes are also available. Contact Lori for more information on sizes. To place an order, call or email Lori Albright at (330) 608-5340 or email albrightlori@hotmail.com. You can also place orders through KnappNotes via email at knappnotes@gmail.com. Lori Knapp Albright will deliver t-shirts locally. She will need a check/cash from you when she delivers your shirt(s). For out-of-towners, please mail Lori a check at Lori Albright, 3637 Torrey Pines Dr, Akron, OH 44333 and she will bring your t-shirt(s) to the Reunion. This entry was posted in Reunion, T-Shirts. Bookmark the permalink.